James “Mad Dog” Mattis is the announced nominee by President-elect Donald Trump to serve as secretary of defense in the coming administration. Mattis, a recently retired Marine Corps general who last served as commander of U.S. Central Command, is a revered figure by fellow members of the U.S. armed services. At a rally on Thursday, Trump described the general as the “closest thing we have to Gen. George Patton,” who was best known for his military leadership during World War II. Far from a rough-and-tumble leader, alongside “Mad Dog,” his intellect has earned Mattis the “Warrior Monk” moniker. And he’s spoken some epic quotes over the years. “The most important six inches on the battlefield is between your ears. “Engage your brain before you engage your weapon. “No war is over until the enemy says it’s over. We may think it over, we may declare it over, but in fact, the enemy gets a vote. “I’m going to plead with you, do not cross us. Because if you do, the survivors will write about what we do here for 10,000 years. 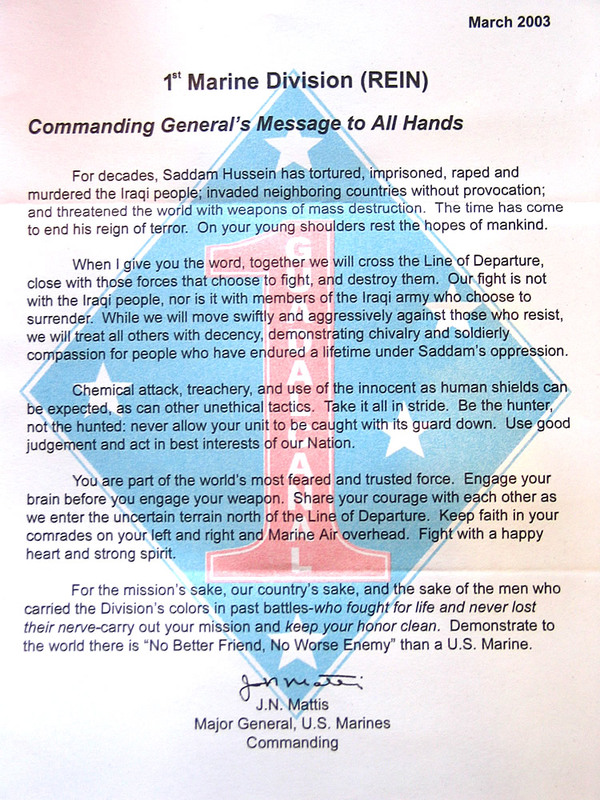 And a little bonus content that is well worth your time — the general’s message to his 1st Marine Division as they prepared to enter combat in Iraq.